A team of researchers has discovered a supermassive black hole at the center of ultra-compact galaxy M60-UCD1, making this galaxy the smallest ever found to host a supermassive black hole. Astronomers using the NASA/ESA Hubble Space Telescope have found a monster lurking in a very unlikely place. New observations of the ultra-compact dwarf galaxy M60-UCD1 have revealed a supermassive black hole at its heart, making this tiny galaxy the smallest ever found to host a supermassive black hole. This suggests that there may be many more supermassive black holes that we have missed, and tells us more about the formation of these incredibly dense galaxies. The results are published in the journal Nature. Lying about 50 million light-years away, M60-UCD1 is a tiny galaxy with a diameter of 300 light-years — just 1/500th of the diameter of the Milky Way. Despite its size it is pretty crowded, containing some 140 million stars. While this is characteristic of an ultra-compact dwarf galaxy (UCD) like M60-UCD1, this particular UCD happens to be the densest ever seen . Despite their huge numbers of stars, UCDs always seem to be heavier than they should be. Now, an international team of astronomers has made a new discovery that may explain why — at the heart of M60-UCD1 lurks a supermassive black hole  with the mass of 20 million Suns. This Hubble Space Telescope image compares the size of M60-UCD1 to the gigantic NGC 4647 galaxy. The team discovered the supermassive black hole by observing M60-UCD1 with both the NASA/ESA Hubble Space Telescope and the Gemini North 8-metre optical and infrared telescope on Hawaii’s Mauna Kea, USA. The sharp Hubble images provided information about the galaxy’s diameter and stellar density, whilst Gemini was used to measure the movement of stars in the galaxy as they were affected by the black hole’s gravitational pull. These data were then used to calculate the mass of the unseen black hole. The finding implies that there may be a substantial population of previously unnoticed black holes. In fact, the astronomers predict there may be as many as double the known number of black holes in the local Universe. 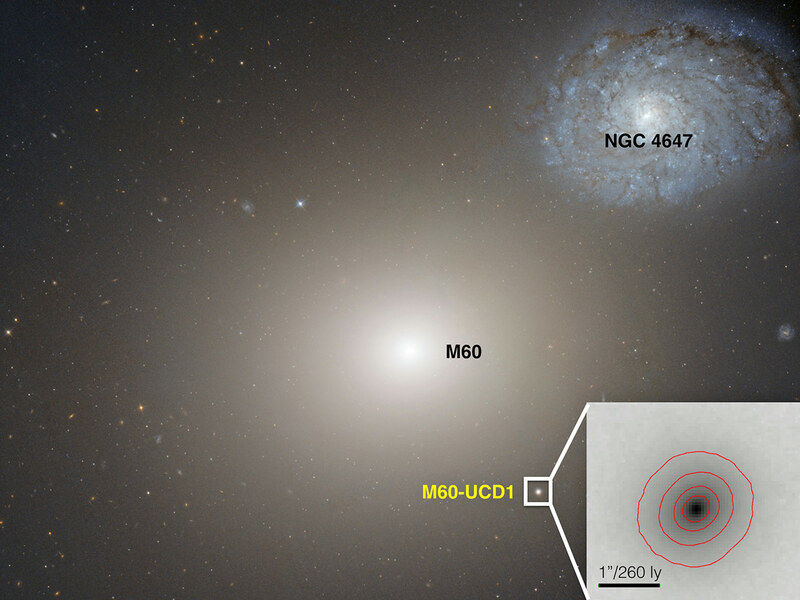 The team believes that M60-UDC1 may one day merge with Messier 60 to form a single galaxy. Messier 60 also has its own monster black hole an amazing 4.5 billion times the size of our Sun and more than 1000 times bigger than the black hole in our Milky Way. A merger between the two galaxies would also cause the black holes to merge, creating an even more monstrous black hole. In fact, if you lived inside this galaxy the night sky would dazzle with the light of at least a million stars, all visible to the naked eye. On Earth, a comparatively measly 4000 stars are visible. Black holes are ultracompact objects with a gravitational pull so strong that even light cannot escape. Supermassive black holes — those with the mass of at least 1 million stars like our Sun — are thought to be at the centers of many galaxies. 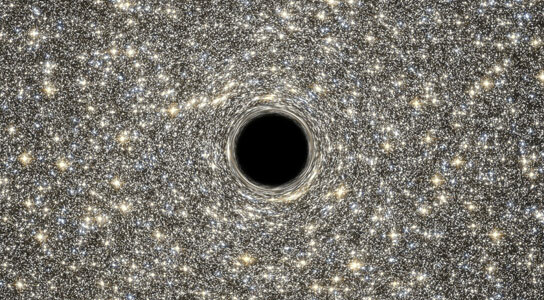 Be the first to comment on "Hubble Reveals Smallest Known Galaxy with Supermassive Black Hole"